Attended UMASS as an ROTC candidate and graduated with a degree in astrophysics. Pilot training (49 weeks) Edwards AFB (age 23) Completes pilot training and receives first assignment and goes through follow up training for his assigned aircraft the F4. Captured by Viet Cong in late 1966. Was injured and rescued (escaped) late 1967 by a Marine patrol. Accelerated Naval Aviation tactics Newport Naval War College. Straker promoted to Colonel - (age 32). Involved in Rolls Royce accident' that caused the death of the British Defense Minister who was meeting with Henderson and Straker. Although the Commander has more airtime than any other character, he sparks quite a bit of debate in any discussion forum. Under the cold icy exterior lies a very complex man. His back story has more onscreen canon than any of the other characters. We know from the series that he was married just before the UN gave approval to SHADO and the startup and construction ended up destroying the marriage. It is generally believed that Ed and Mary separated soon after their son was born. In 1970 Straker was a full Colonel in the USAF and there has been much debate as to his age. Deb has him at 32 and I have gone with that as a basis for my work. He could not have been much younger that that as most full birds are in their mid to late thirties. Being promoted that young would indicate an exceptional military career. Straker was an astronaut and therefore a test pilot as well. In “The Man Who Came Back” we learn that Straker and Collins had flown the mission to put SID in operation. He probably rode a Saturn V on the mission as it was the only booster (Even today) capable of mounting a mission to the SID parking orbit. Fan Fiction writers have portrayed him in a wide range of relationships mostly with original characters. In my “Soul Mates” saga I explored a relationship with Virginia Lake. It was a new concept and it had only been hinted on in the FAB-UFO round robin “Feelings of Misgivings.” Being the first to tackle the concept was a treat. In my other storylines they are very close friends although they share an underlying attraction they never act on. 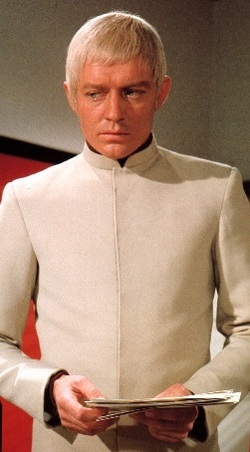 I see Ed Straker as a person that had walked through and survived hell that would have crushed a lesser man. I also saw him mellowing towards the end of the series and my stories reflect that trait.